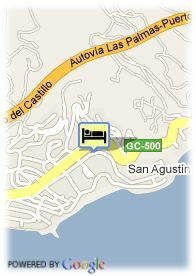 Calle Los Jazmines 25, 35100 Playa del Ingles, Spanje. 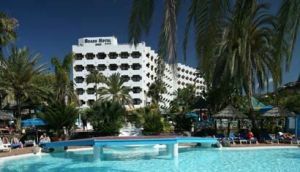 IFA Beach Hotel stands practically right on San Agustín Beach, a gently sloping beach of dark coloured sand, which is ideal for families with children. This little nook, San Agustín - smaller than the 6 kilometre away neighbouring Playa del Inglés, is characterised by being quieter, though even so, it does not lack choice of entertainment. Not far from the hotel is the International Casino, as well as a large shopping and leisure centre. This three star hotel comprises 200 bright and spacious rooms, the great majority with direct or lateral views over the sea. Larger capacity family rooms are also available. The bathing area includes two swimming pools and two Jacuzzis in the midst of subtropical greenery, among which sun loungers and parasols are available free of charge. The main restaurant and the pool snack bar, the latter affording direct access to the beach - serve both traditional and international food, including show cooking and theme meals. The hotel offers both half board and all inclusive service. In the evenings, live music is regularly provided and on occasions there are evening shows and daytime entertainment.